Very welcoming spot! 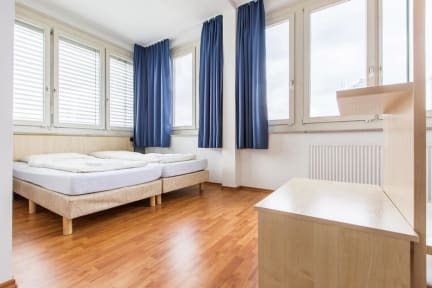 Clean and really close to downtown Hamburg! I’ll be coming back again for sure! Don’t be afraid to book here based on some reviews. I was at first but I’m glad I came. There is plenty of space in this hostel And the beds are comfy, though they do have a charge for linen- blankets and pillows are included though. Best of all, this place is very clean! That is very important, and the showers are really nice. It all depends on what you look for in a hostel, but overall, this place is great value for price and nice to stay in. I’ll be back ! The A&O Hostels are all the same, very unpersonal, more like a Hotel, but well equipt and clean. This Hostel is very, very big, with a huge lounge area and a nice roof terrace. It is well located with an metro/train station only three minutes away, were a lot of different trains stop. But around the building itselfe, there is not much to do, since there are just other Hostels/hotels and offices. Super low quality for Berlin. The room had dirty dishes when I arrived and when I came home someone had taken my bed and was sleeping with an extra guest in it. Horrible organization. Put me in a all girls dorm (according to my roommate this had happened several times that week already) and made me get out at about 1 a.m when I was already sleeping and everyone in the room was fine with it for the night. On top of that the washer worked good but the drier didn't work and the employees were useless in helping me try and figure out the drier which never got done so I had wet clothes for the past couple days. Don't go here. I do not recommend this hostel what so ever. Horribly understaffed anytime I had questions about the area or hostel I would have to wait at least 10-15 minutes in line. The lockers were alright but was unable to use my own lock on them as it would not fit! They provided a lock that just closes it after working with it for a long period of time and waking up everyone in my room! I will not be back. Firstly our bedroom smell really bad to alcohol, the bathroom wasn't cleaned and furthermore someone had taken the blanket and the pillow of our beds, what it's a bit disgusting. Secondly, the security is absolutely none. Someone in my room stole my money and left. In the reception they gave me any solution, even they said that these things can happen because the hostel is big. There is any control of who enter and leave. Third, the people in the share rooms are especially strange.